Over the years I’ve become a big fan of Faber-Castell fountain pens. Their nibs are consistently smooth, smooth, smooth. 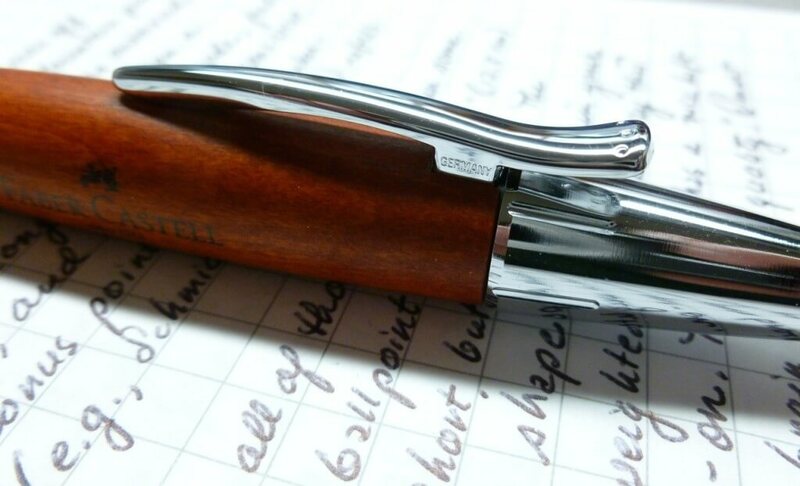 The Faber-Castell E-motion (parquet version) was my first Faber-Castell fountain pen. 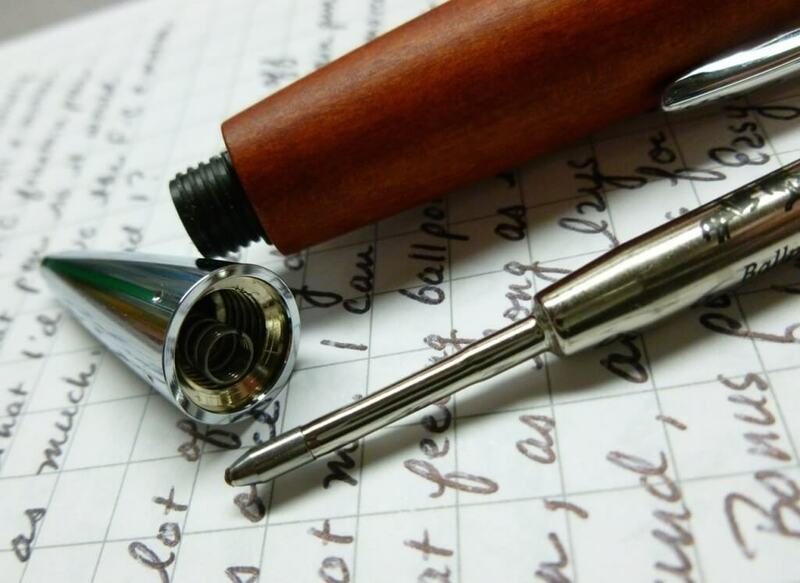 I love how that pen feels in hand, so it stands to reason that I’d love the E-motion ballpoint just as much. So do I? There are plenty of pen lovers who swear off ballpoint pens in favor of gel or fountain pens, but that’s not me. I’m as thrilled by a great feeling and performing ballpoint as I am by a sweet, smooth fountain pen—as long as it’s well-made, feels good to hold, and lays down a consistent and dark line. Bonus points for it taking Parker-compatible refills, like the Schmidt EasyFlow 9000. 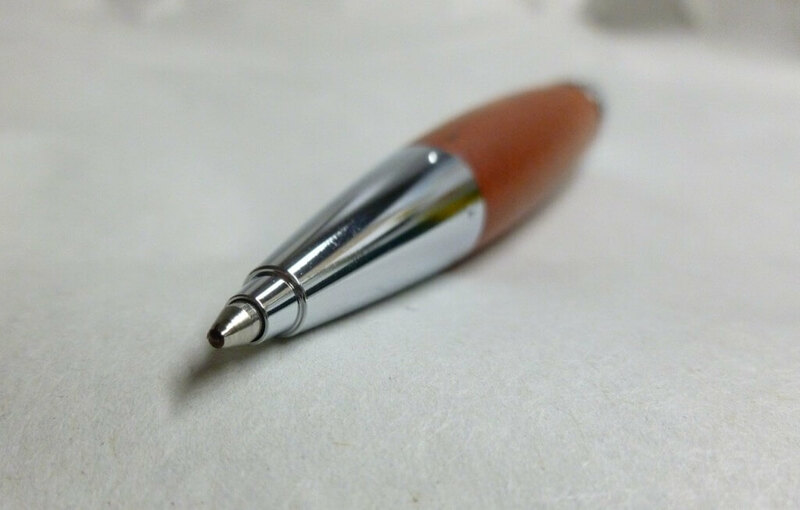 The writing tip extends with a simple twist of the smartly polished end cap. The spring-loaded clip is graceful curved and surprisingly sturdy. There’s not a wiggle to be found anywhere on this pen. The pear wood body is warm, smooth, and rich looking— like good furniture. The E-motion mixes two very different looks—industrial chrome alongside polished wood. The look is both organic and modern at the same time—really striking. I love the wood so much that I’m very protective of it. 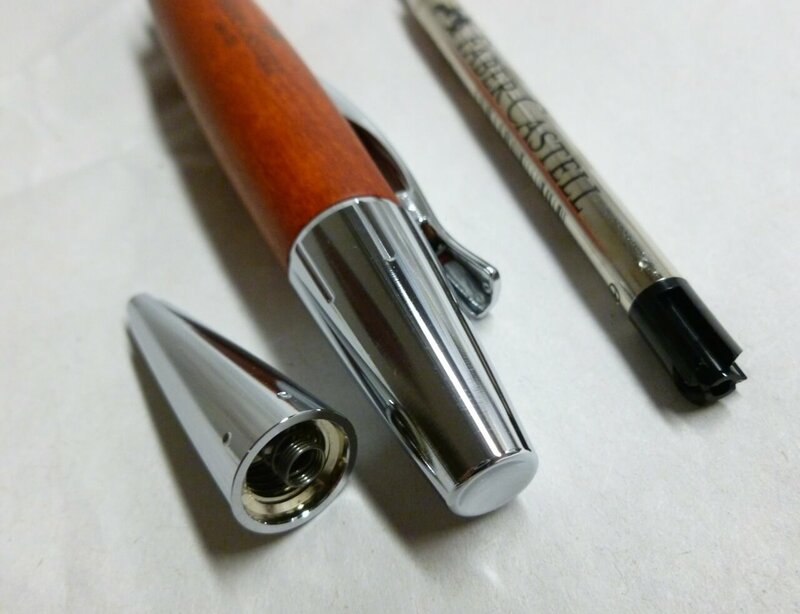 This isn’t a pen that I’d carry in my pocket where that gorgeous wood might get scratched by keys or coins. I’d hate to build up a “patina” of scratches, but that’s just me. The E-motion takes a Parker-style refill. I was prepared to swap in my favorite—the Schmidt EasyFlow 9000—but the included Faber-Castell one (black/broad) turned out to be excellent—smooth and dark. No need to swap. 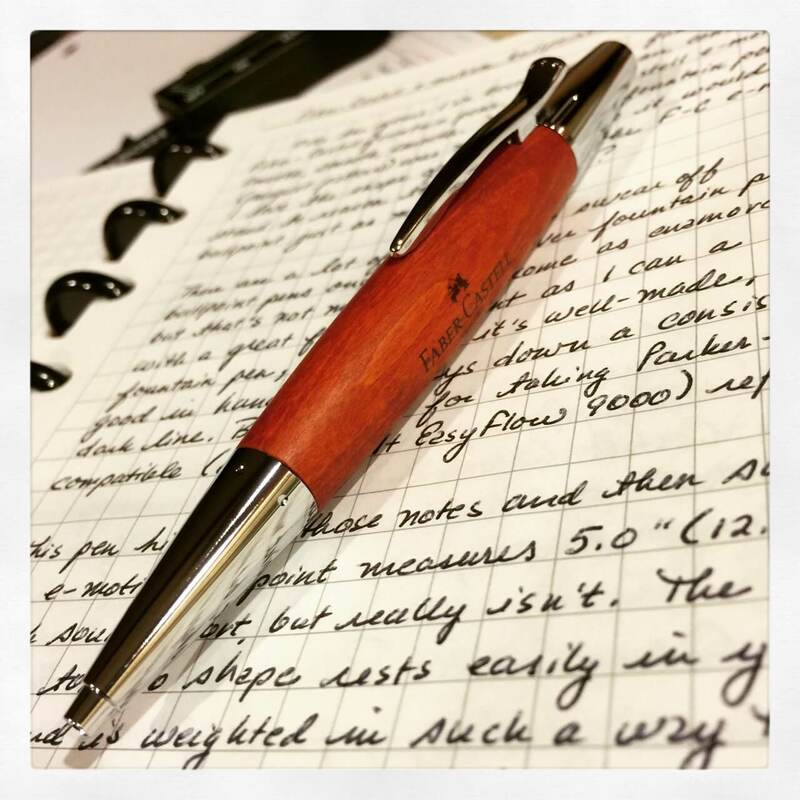 The pear wood E-motion ballpoint pen is smart-looking, great feeling, and smooth writing. It’s yet another winner from Faber-Castell, a company that’s been around since 1761. They obviously know what they’re doing. Great company, great pen.